Kenneth Hall, Professor and Ken Wannberg Endowed Chair in Music Editing, passed away on the evening of August 25th, 2016. Ken joined the faculty of the USC School of Cinematic Arts in 2005 and, in addition to overseeing and teaching many courses on sound, taught the popular class, Directing the Composer, which was so beloved that alumni of the course would come back for the final session as an impromptu reunion every year. 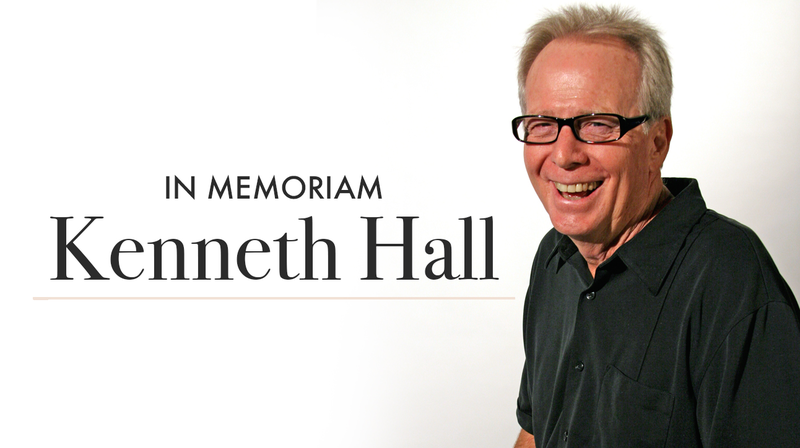 Hall is remembered as a warm spirit who genuinely loved teaching and took a personal interest in his students’ growth. Hall edited and completed over nine-hundred and fifty films and TV productions in his storied career. He was associated with several Oscar-winning and nominated pictures including: E.T. : The Extra-Terrestrial, The Amityville Horror, Star Trek: The Motion Picture, Patton, Under Fire, Poltergeist, Gremlins, Hoosiers, Basic Instinct, L.A. Confidential, and Mulan. Hall received two Gold Records for E.T and Mulan and was nominated for the Motion Picture Sound Editors Golden Reel Award for First Knight, L.A. Confidential, Executive Decision, Mr. Baseball, The Ghost & the Darkness, Star Trek: First Contact, and Mulan. Hall worked with some of the most respected and talented film composers in the world including: John Williams, Jerry Goldsmith, Alex North, Henry Mancini, John Barry, Bill Conti, Maurice Jarre, Lalo Schifrin, Marvin Hamlisch, Lionel Newman, and Miklos Rozsa.